My clothes don’t fit and my mom hates SNAPS! 10 days ago, my sister gave our mom her first grandchild and he is such a bundle of perfection that his dad is having a fit about going back to work today after a week’s paternity leave. Our mom flies out to see little Calvin and to calm down my stressball sister (it’s just the way she is), reassuring her that she’s doing a great job. Because she is! She’s just got new-mom nerves. I’m not rich-rich, but I’m Amazon-rich! My sister lives an hour from the nearest Target and Costco, and buying locally is hideously expensive. I’ve got this wonderful combination of a big fat Amazon gift card balance and Prime 2-day shipping. See that adorable picture to the left? 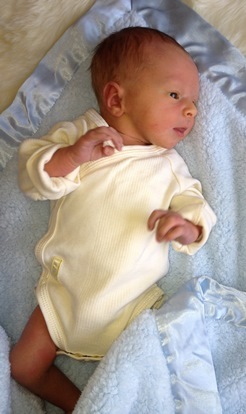 That’s the first picture of him in clothes rather than baby blanket togas because 0-3 month outfits are too big on him. At the same time, my sister realized that her ideal of never using baby wipes and only warm washcloths was both impractical and icky. Two days later, she was happily washing 8 brand new zippered sleep-n-play suits (she found all the snaps on onesies to be a huge pain) and using Seventh Generation wipes for diaper changes. Not bad for -$60 off my credit balance. Then over the weekend I saw a deal on Burts Bees baby wash on Amazon – a 3-pk of 12oz bottles for $15.50. My sister is trying to use as much organic or natural products as possible, and I know she’s a Burts Bees fan. I also got a great deal on Aveeno baby products back in January, so the timing is good for a “refill”. Impressed by how fast things got delivered, she texted me this morning about getting him some new bottles because his lip is getting very red. Yeah, breastfeeding didn’t work out for her – she had massive reduction surgery 15+ years ago, so her odds were not good to begin with. Anyway, I have a feeling that the redness she’s seeing is pretty common and not avoidable, but who cares – she needs bottles anyway. I overnighted the 5-bottle gift box from Amazon for an additional $3.99 and the rest will get there in 2 days. Another -$55 off my balance. This is why I didn’t go crazy with big shower gifts. I sent little practical things as deals arose on Amazon and will continue to do so as she finds her way to the right balance of what’s good for the baby and what works for her. I’m also blatantly trying to “buy” the first invitation to visit, since she’s barely tolerating my mom – pregnancy turned her into a germophobe. Harumph. My sister unfortunately lives in Aspen, and the only airline that has consistently served that destination is United, and so there are rarely any “deals” to fly there. Luckily, they have the best frequent flyer program, and I’ve got my account stocked with 72K miles and another 55K hitting next month. That’s 5 free visits to hang with my little nephew, with one checked bag free 🙂 Oh yeah, I’m workin’ it alright. How have I managed that many in a month? Well, a friend of mine shops for her family at Walmart and spends at least $100 every week…so I buy a $100 gift card for her every week and she PayPals me $100 cash for it. That’ll be worth about 5K miles per year. I earn 5 miles/points per dollar spent on cell/phone/cable/internet – that’s 1050 miles a month for me. I’ve also put my mom’s plan on my bill and she pays me instead of the cable company, boosting my miles by another 850/month. Those are just the easy things I normally pay for and that I’ve arranged with people I can trust. That’s worth a Calvin visit each year 🙂 Yes I’m doing a lot more than that to beef up the miles, but even if I lose interest in this new mile-mongering hobby, this will tick over painlessly for one ticket a year. Yay!